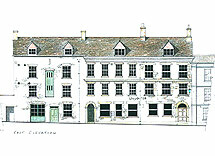 The Counting House is a splendid listed building in the heart of Tetbury. We completed this major redevelopment in 2009. The three upper floors have been converted to provide nine spacious apartments and flats in Tetbury, with the benefit of a delightful walled town garden. There has been a bank on the site since the 1790s and the overall development has retained the Lloyds Bank plc Banking Hall and created a most attractive premises and courtyard occupied by Highgrove, one of The Prince of Wales's charities. This was an exacting project which has revitalised this formerly dormant part of Tetbury.